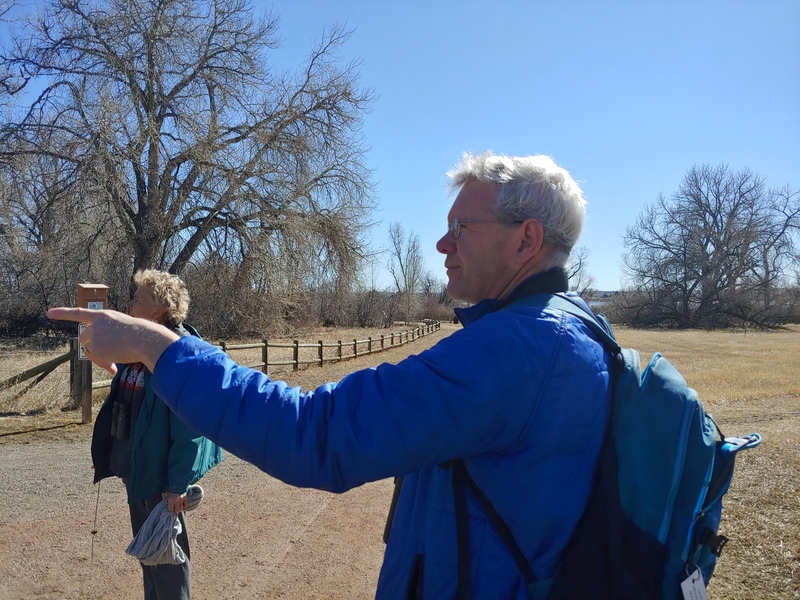 It was a beautiful, but blustery, morning when we set out for Wanaka Lake Park and Greenlee Preserve where we were joined by Lafayette resident and expert birder, Ted Floyd. 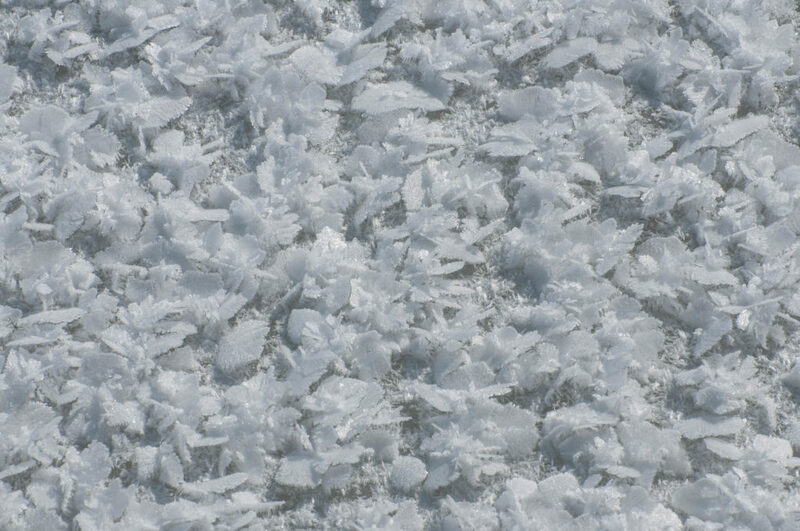 The wind ended up being fortuitous because it broke up the thin skin of ice on Wanaka Lake. That meant we got to enjoy ducks and geese that would otherwise have been elsewhere, including Gadwall, Mallards, Northern Shovelers, a male Common Goldeneye, a group of Common Mergansers, and both Canada and Cackling Geese. The latter is distinguished from the former by their much smaller size, daintier bills, and stubby necks. After surveying Waneka, Ted led us to Hecla Pond, which is a short walk from Waneka. In the late 1800’s and early 1900’s, Lafayette, CO was a big coal mining town and Waneka Lake Park used to be the site of a power plant that operated from 1907 until 1957. There are remnants of this history in the large ore boulders we passed on our walk to Hecla. We spent a few minutes admiring the lichen growing on the surface of the boulders. Though small, Hecla Pond was no less interesting than Waneka. We were able to get good looks at a pair of Hooded Mergansers and compare them to the larger, sleeker Commons we’d seen earlier. 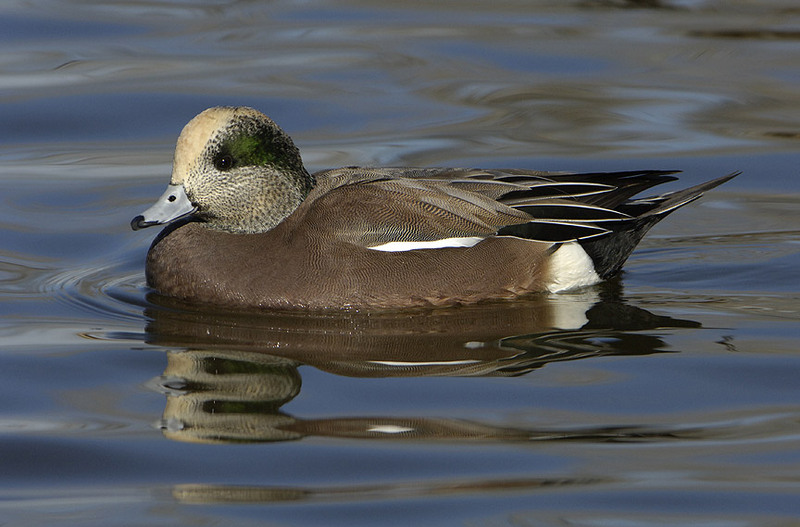 We added American Wigeon to our list for the day there, as well as Ring-necked Duck (named for the faint, almost invisible ring around its neck rather than the much more obvious ring around its bill!). The wind kept our numbers of songbirds down, but back at Greenlee Preserve we logged Red-winged Blackbirds, Dark-eyed Juncos, and American Robins. 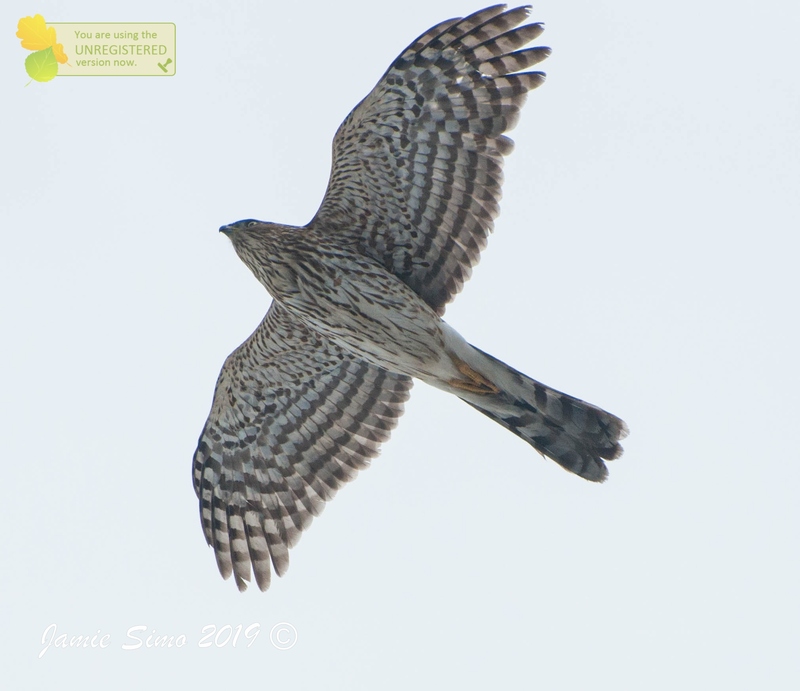 We even had a Cooper’s Hawk fly over us! 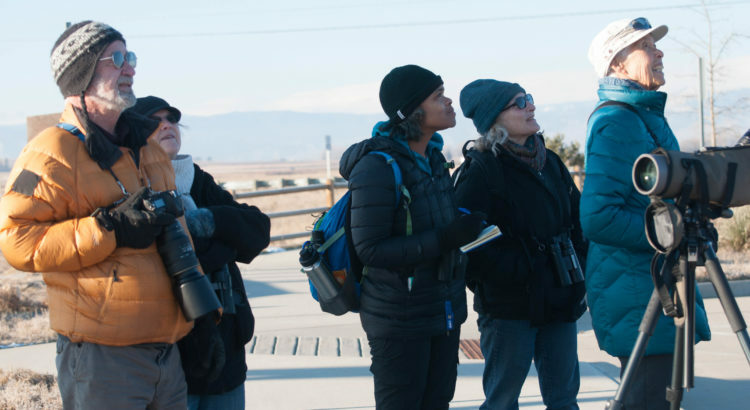 Lafayette hosts bird walks at 1:00pm from Greenlee Preserve on the first Sunday of every month, so stop by if you’re in the area then. Eight birders braved the arctic temps to enjoy Teller Farms this gorgeous, February morning. Teller Farms is a working farm with a trail winding through grassland, past several ponds and under an occasional stand of trees. 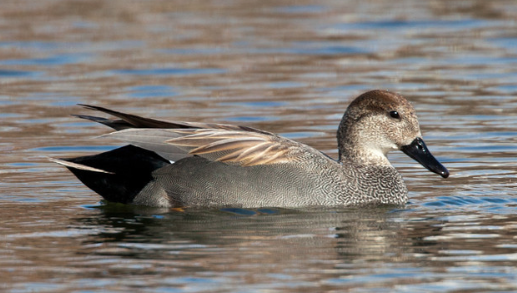 While the cold meant there was no open water for ducks, limiting the number of species seen, we were able to take our time and examine common species like the Northern Flicker and the Song Sparrow. The weather didn’t deter some birds at all though. Raptors were the highlight of the day with great views of both male and female American Kestrels. One male even enjoyed his mouse breakfast just a few yards away from us! 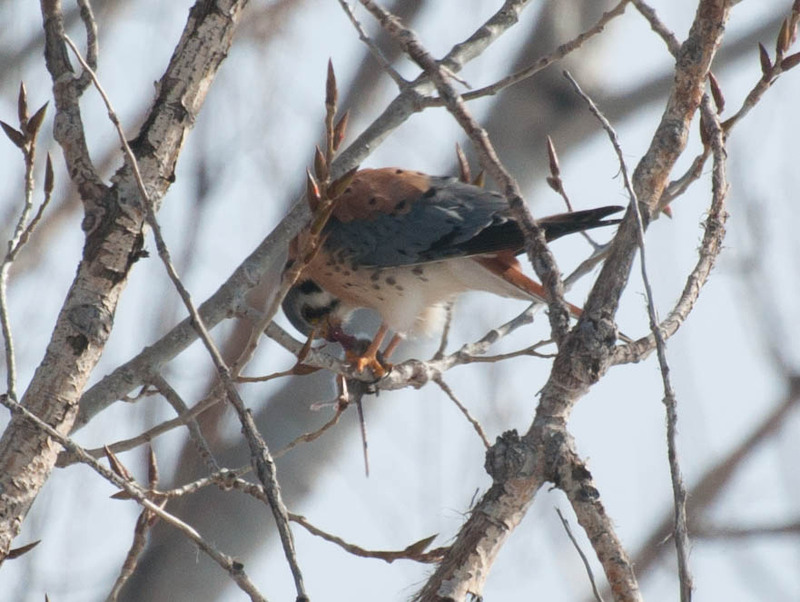 Though smaller than his mate, the male American Kestrel is brighter with slaty blue and rusty red adornments. We also saw 2 different Red-tailed Hawks, one a light morph and one a dark morph. The Red-tailed Hawk is one of the, if not the, most variable of raptors ranging from the pale Krider’s to the almost black dark-morph Harlan’s. An adult Bald Eagle, serenely perched in a distant tree and a Northern Harrier gliding low over the grass using its dish-shaped face to funnel the sounds of scurrying rodents to its ears, rounded out the raptor extravaganza. However, we’ll give an honorary mention to the Blue Jay mimicking a Red-tailed Hawk’s cry that had a few of us fooled momentarily! Another special highlight came in the form of a mammal: a pair of coyotes loping across the grass. When we caught sight of them again, one had scored a meal of cottontail. 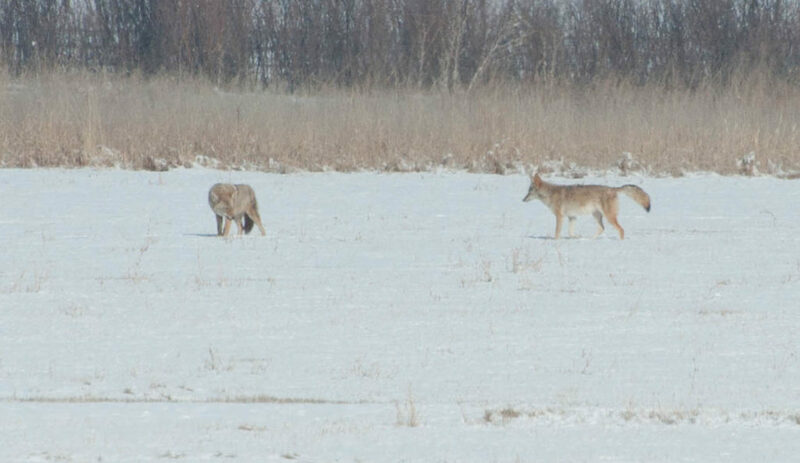 It wasn’t clear whether the two were a mated pair or parent and not-quite-adult pup, but the larger coyote definitely wasn’t up for sharing its catch! When out in nature, you never know what you’ll see! Next up: Walden Ponds on Saturday, February 16th! Fourteen of us began the morning by scoping and binocularing (why not, in an era when we are “verbizing” so many of our nouns?) South Platte Reservoir. This large reservoir was completed in 2007, having been converted from an old gravel mine. 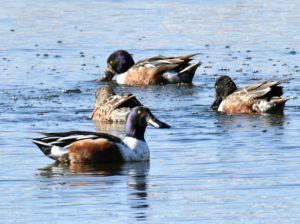 While its surroundings are rather sterile and vegetation almost non-existent, it continues to be a reliable haven for rare winter waterfowl in the south metro area. Almost every year we get one or more Long-tailed Ducks here, last year there was a Yellow-billed Loon, this year there were some Trumpeter Swans, and generally we get one or more of the three scoter duck species here. 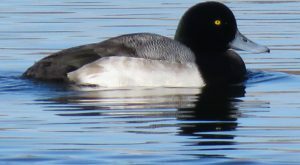 We were fortunate to see a single female Black Scoter, a single male Red-breasted Merganser, and a good representation of the more common winter ducks. 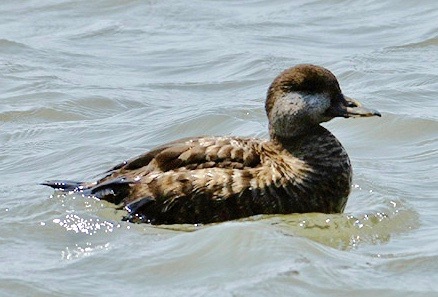 Black Scoters breed primarily in northern Quebec and northern Alaska. 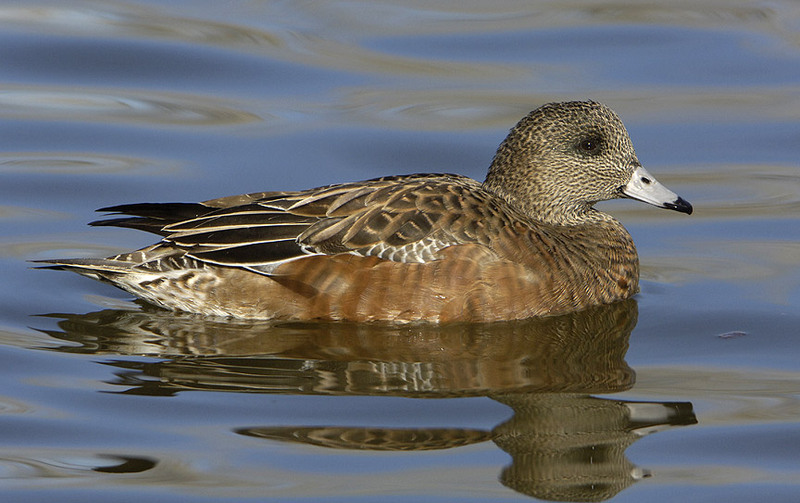 Their major wintering areas are the coastal waters of Maine, Massachusetts, Alaska, British Colombia, and Washington. Any occurrence in the center of the continent is unusual. 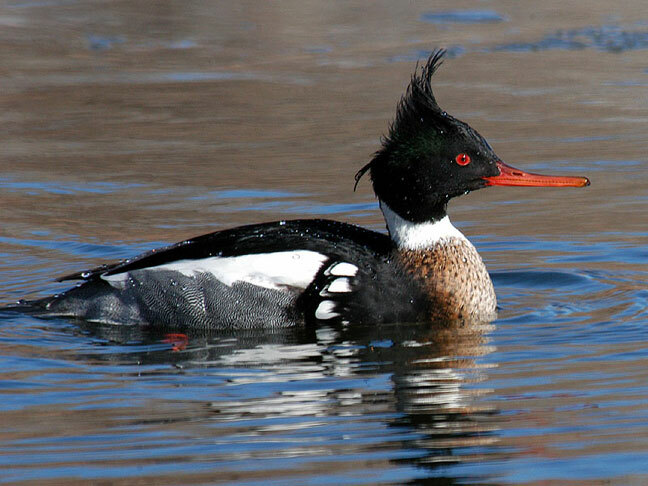 Red-breasted Mergansers are not as rare an occurrence as the scoters, but it is certainly a special treat when we get to see them – a personal favorite of mine. We ended up with fourteen species of ducks which was pretty good. Our other somewhat unexpected bird of the morning was an American Dipper under the C-470 bridge amidst all the current highway construction. We were easily within twelve feet of this bird, and it was totally unperturbed, even going so far as to sing a little bit for us. And, they have a delightful song! What makes this sighting unusual is that Dippers don’t tend to venture too far out on to the eastern plains. They can make it about as far east as Loveland, Longmont, the Rocky Mountain Arsenal, and Cherry Creek Reservoir, but those occurrences are fairly unusual. 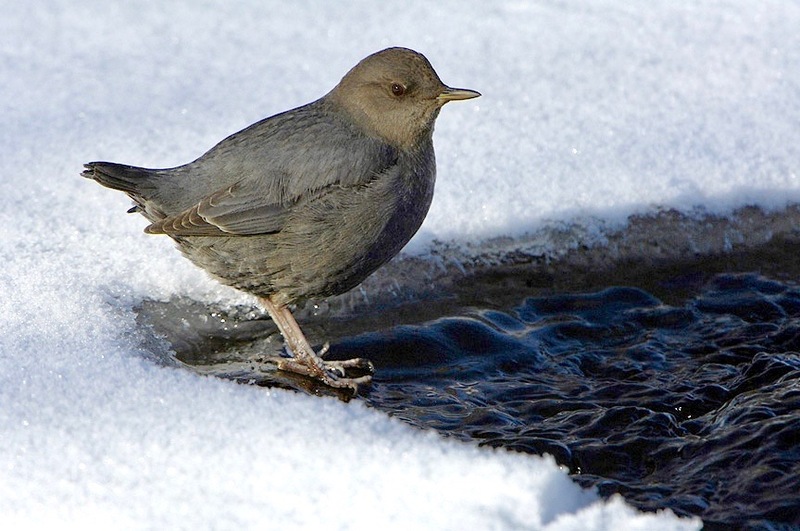 Of additional interest is that a Dipper was seen in this exact same location on a Front Range Birding Company walk led by Jennifer O’Keefe on January 5th– presumably the same individual. Hope to see you soon on our next walk. We had a raucous start as music blared across the parking lots at Hudson Gardens in anticipation of the Frosty’s Frozen 5 and 10 mile races. Fortunately, we were ahead of the nine o’clock start time, and got out along the South Platte trail before the runners came by, and then safely sequestered ourselves well away from the action at the appropriate moments – all done very serendipitously. So, to begin with, though the temperature was only about 30 degrees, it seemed to feel much colder, and we initially had only a few landbirds, an American Robin and some House Finches, but then as we got over to the river things picked up significantly. 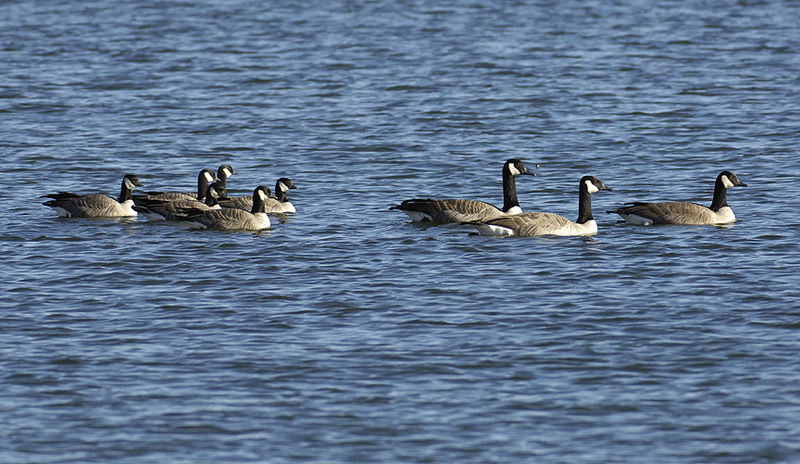 The middle of the river was packed with Cackling Geese with their heads tucked away. There were at least 600, possibly as many as 800. Over the next forty minutes or so they gradually began to untuck, but they were in no hurry to leave. 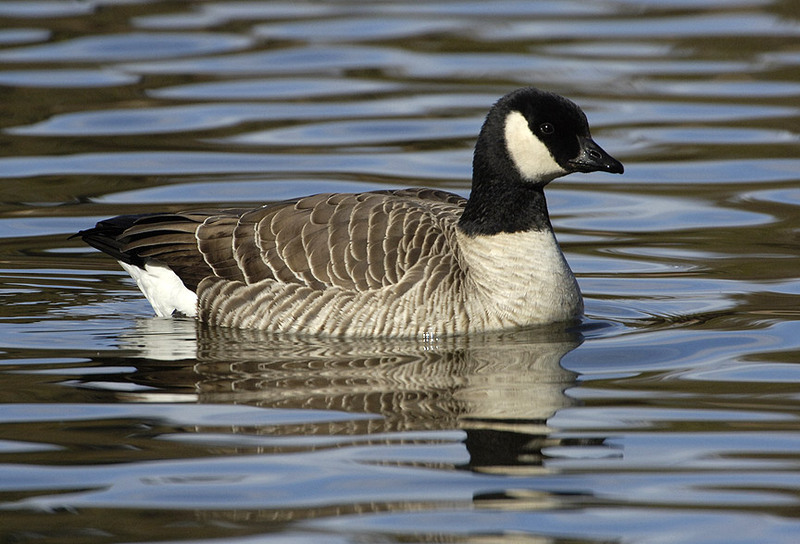 Distinguishing Cackling Geese from Canada Geese is one of the great birding challenges. Up until 2004 they were considered one species, and it’s easy to see why – they look VERY similar. 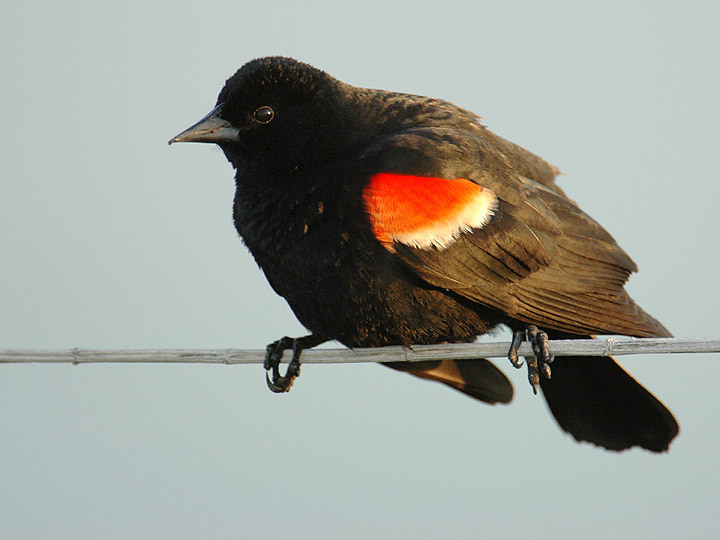 As with so many bird taxonomy questions, genetic analysis has led to this reclassification. 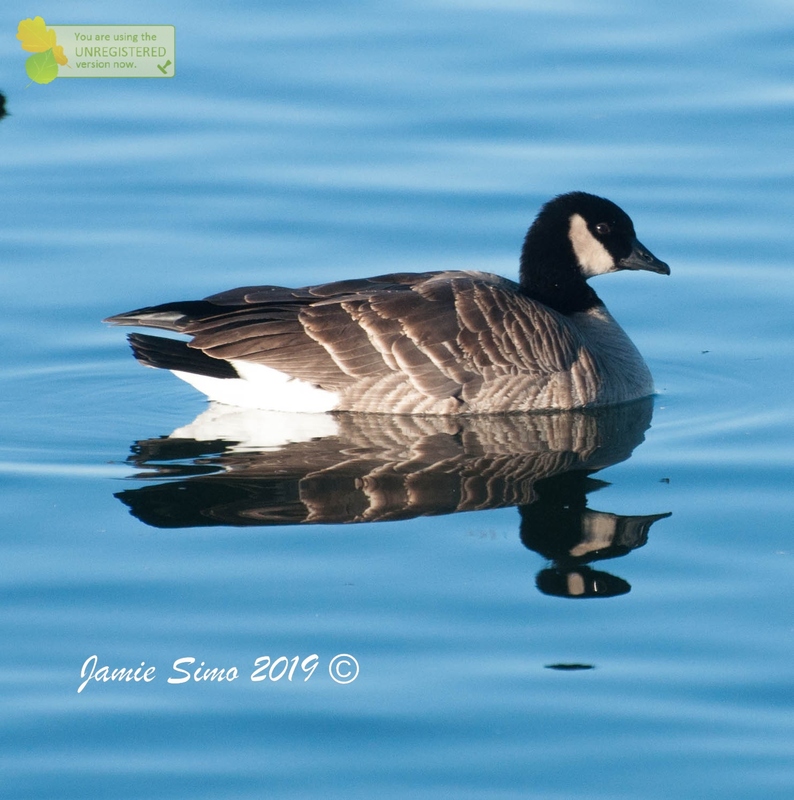 Generally speaking, Canada Geese are bigger, and Cackling Geese are smaller, but this all gets complicated by the fact that there are roughly seven subspecies of Canada Geese and four of Cackling Geese, all of which are of variable size and with some overlap between groups. So, not to prolong this any further, a good place to start in distinguishing Cackling Geese is to look for a stubbier, shorter bill rising into a steeper forehead; the head itself is small and squarish; the neck is proportionally shorter and thicker, and some of these guys are only slightly bigger than a Mallard. 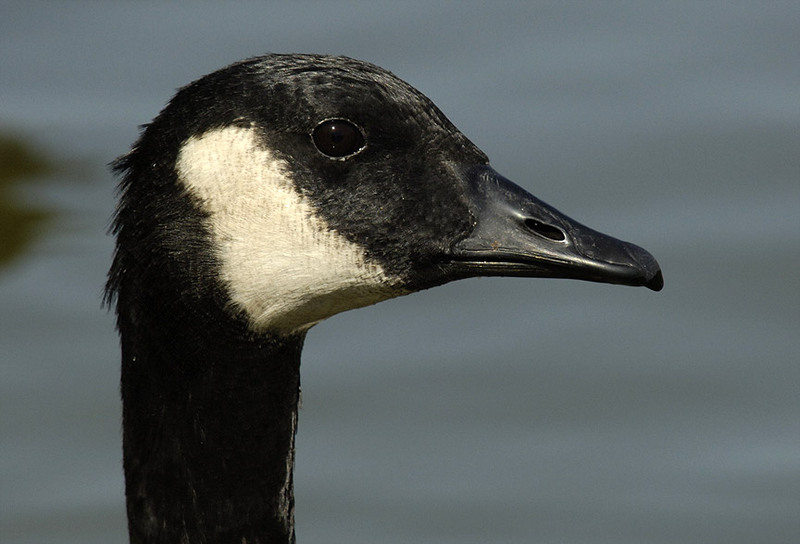 Canada Geese have longer bills rising gradually into a sloping forehead, giving the head a more rounded look; the neck is proportionally longer and thinner, with a tendency to be more “S” shaped. Finally, we have Canada Geese year-round in Colorado, and Cackling Geese breed in northern Alaska and Canada and are only here in the winter. ‘Nuff said! Being right beside the Platte we also had ample opportunity to become experts at distinguishing male and female ducks of several species, both dabblers and divers. One of the interesting winter phenomena in the Denver area is that as we get really cold weather the lakes and ponds can start to freeze over and the ducks then become more congregated along the flowing rivers and streams. We generally see more dabblers along the river, e.g. 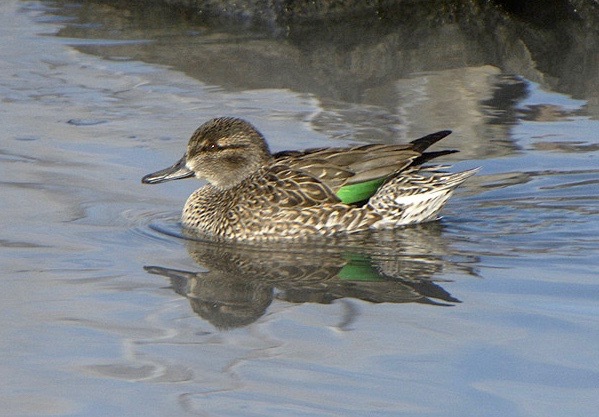 Gadwall, Mallard, and Green-winged Teal, but with the colder weather the divers tend to show up more, e.g. Ring-necked Duck, Bufflehead, Common Goldeneye, and Hooded Merganser. With regard to diet the dabblers are primarily vegetarians, with only a small portion of their diet coming from various insect larvae. 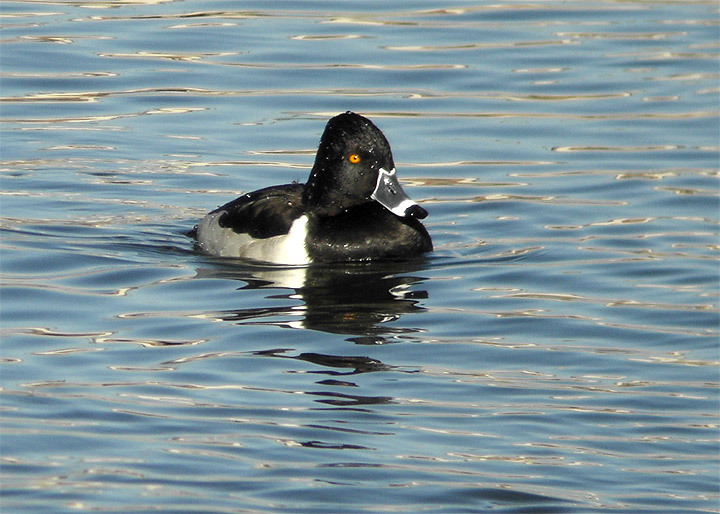 Among the divers, about a fourth of the Ring-necked Duck’s diet is animal based (insects, nymphs, beetles, and mollusks). 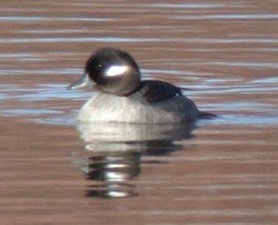 Animal food constitutes the majority of the diet of Common Goldeneye, Bufflehead, and Hooded Mergansers. Other highlights of the morning included an intermediate morph Red-tailed Hawk, which we picked up on flying away from us, but then it accommodatingly flew back towards us and landed right above us on a utility pole. The majority of our Red-tail Hawks tend to be “light morphs,” that is they are pale in the breast and undertail coverts with a streaked belly band. 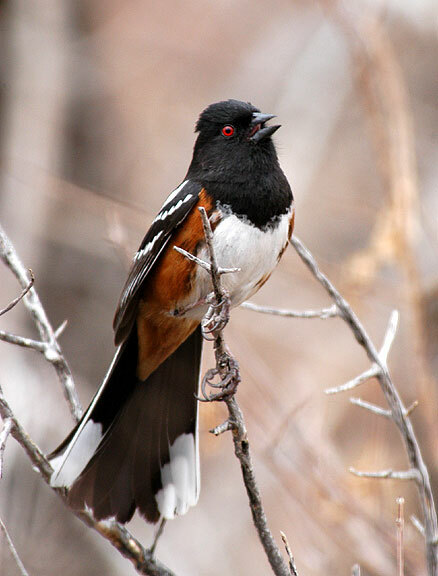 Roughly ten percent of Red-tails, however, are either “dark morph” birds that are all dark chocolate brown, or “intermediate or rufous morph” birds that are reddish-brown on the chest with a dark belly. During breeding season in recent years there has been a breeding pair near Hudson Gardens of a light morph individual with an intermediate morph bird. It seems likely to me that our bird on Saturday may have been the same one that breeds in this area. A great morning with a great group of enthusiastic birders! 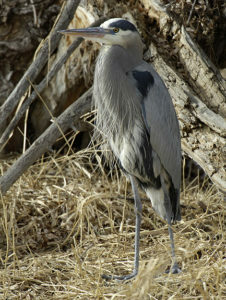 Hope you can make it to the next Hudson Gardens walk or one of the other Front Range Birding Company outings! One way I remember what birds are common in different times of the year is related to weather. For instance, I associate seeing some types of birds with not being able to feel my fingers. Many of the birds we saw on Saturday are ones I would expect to see while shivering, but the recent warm spell had us shedding layers by the end of the walk. 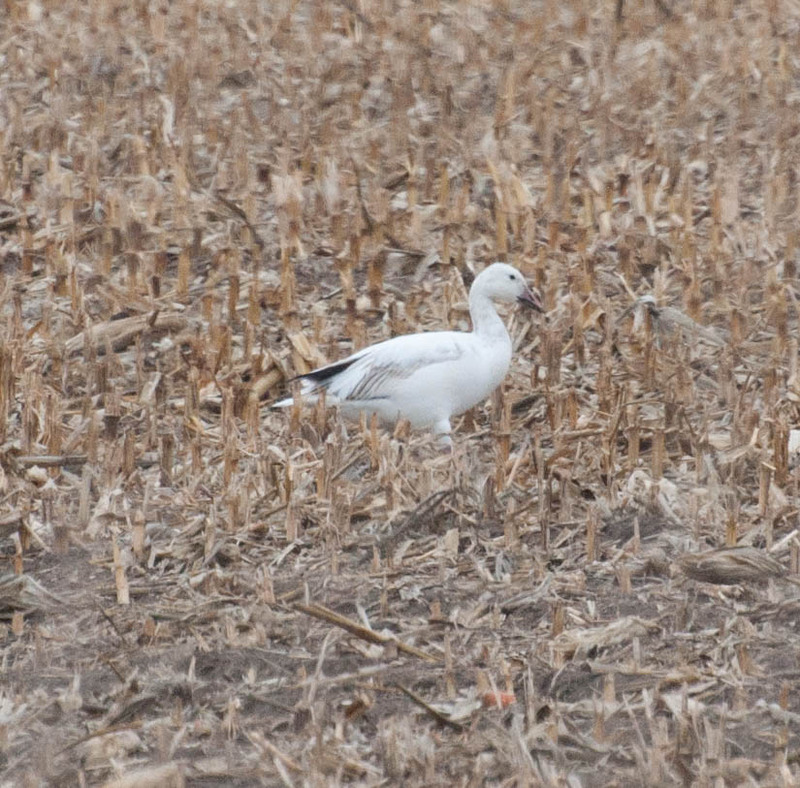 We were fortunate to see both the Trumpeter Swans and the Tundra Swan that had been reported recently, as well as the Black Scoter that’s been hanging around for awhile. We had great looks at so many different types of birds, and were able to spend some time discussing field marks and behavior. It can be tedious to sort out a big lake full of birds, but our group was patient while we went through them. I hope everyone came away with at least one new nugget of information. Once we moved on from the reservoir, we saw smaller numbers of birds but were able to put more attention to those not on the water. We didn’t see many, but we did have good views of an American Kestrel and a Bald Eagle. We ventured under C-470 just for a few minutes to see if we could pick up any other species. There were quite a few birders out that day, and we were lucky to happen upon a group that had just spotted a couple of American Dippers. We relocated one of them, and were able to watch it for several minutes. Thanks to our group for a wonderful morning of birding!! 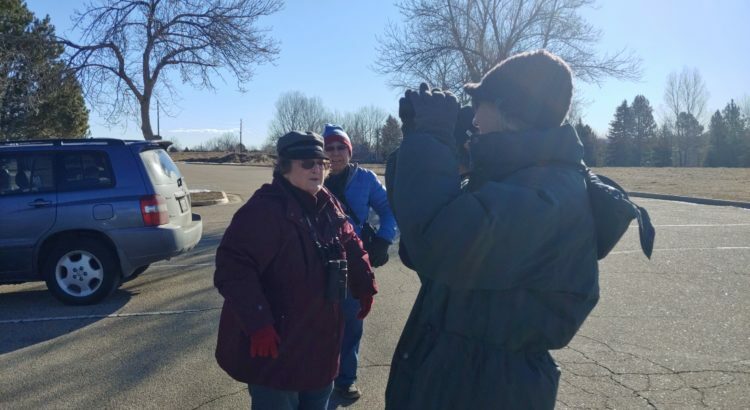 It was a cold, but clear morning when 9 intrepid birders set out for Peschel Open Space. Peschel is a hidden gem in the Weld County portion of Longmont near Sandstone Ranch. While the St. Vrain Greenway trail was heavily damaged by the devastating 2013 flood and parts of it only reopened earlier this year, the flood also created a lot of fantastic wetland habitat ideal for shorebirds and waterfowl. 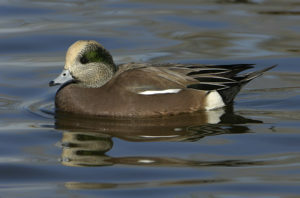 Though Mallards were by far the most prevalent duck, there were also a scattering of American Wigeons, a few Green-winged Teal, and even 4 male Northern Pintails in their full glory. 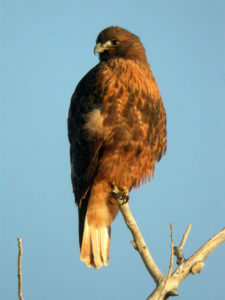 In addition to American Kestrels, Red-tailed Hawks were especially prevalent. We saw 6 different Red-tails. Other raptor highlights were the resident pair of Bald Eagles that made their appearance as we were heading back to the parking lot, 2 Northern Harriers, a Great Horned Owl roosting low in a tree, and a soaring Prairie Falcon. 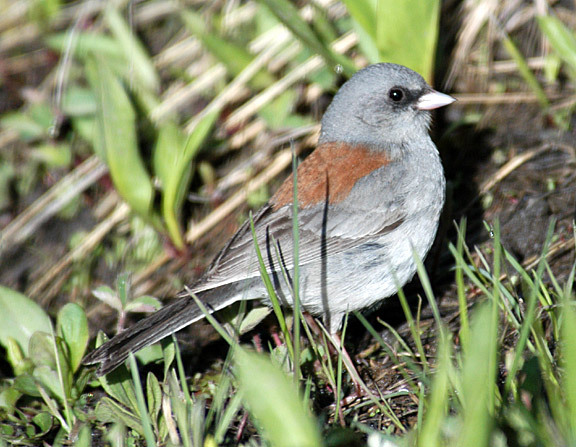 While songbirds were in short supply this time of year, we did see several sparrow species (Song, American Tree, and White-crowned) and heard from resident species such as the Marsh Wren, Northern Flicker, and Blue Jay. The piece de resistance, however, was the American Pipit we saw picking around in the river near the bridge leading to Sandstone Ranch. In all, we saw a total of 35 species, pretty good for an early winter day! Eight of us had a productive morning birding on a gloriously nice fall day. The waterbirds were great, with two species of geese, fourteen species of ducks, plus a couple of Pied-billed Grebes, and some American Coots. Of special note here was a single Snow Goose amidst a long, long line of Canada Geese passing overhead. 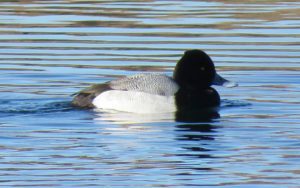 Also, we had to wrestle with the identification of a small group of Greater Scaup. 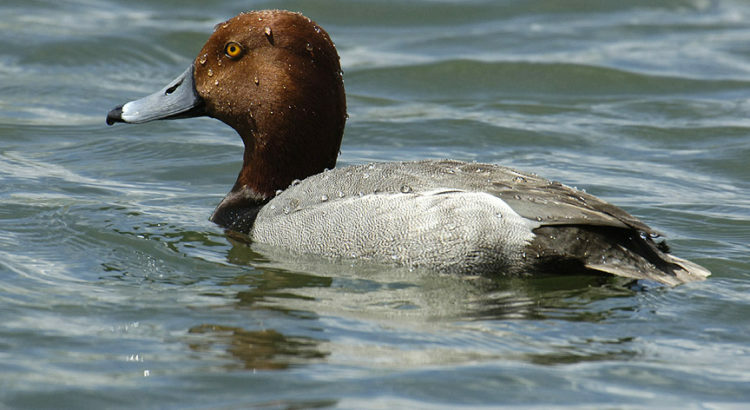 Greater Scaup are member of the genus Aythya, which also includes Lesser Scaup, Ring-necked Duck, Canvasback, and Redhead. 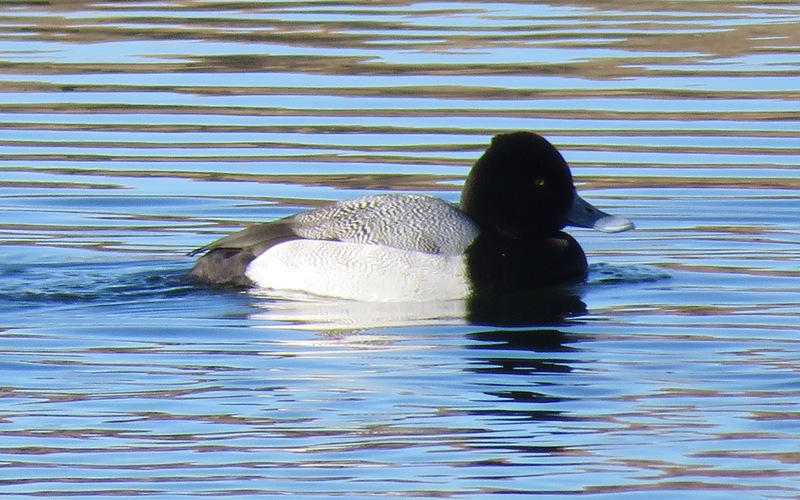 In Colorado Lesser Scaup are far more common than Greater, but telling the two apart presents us with a significant challenge. 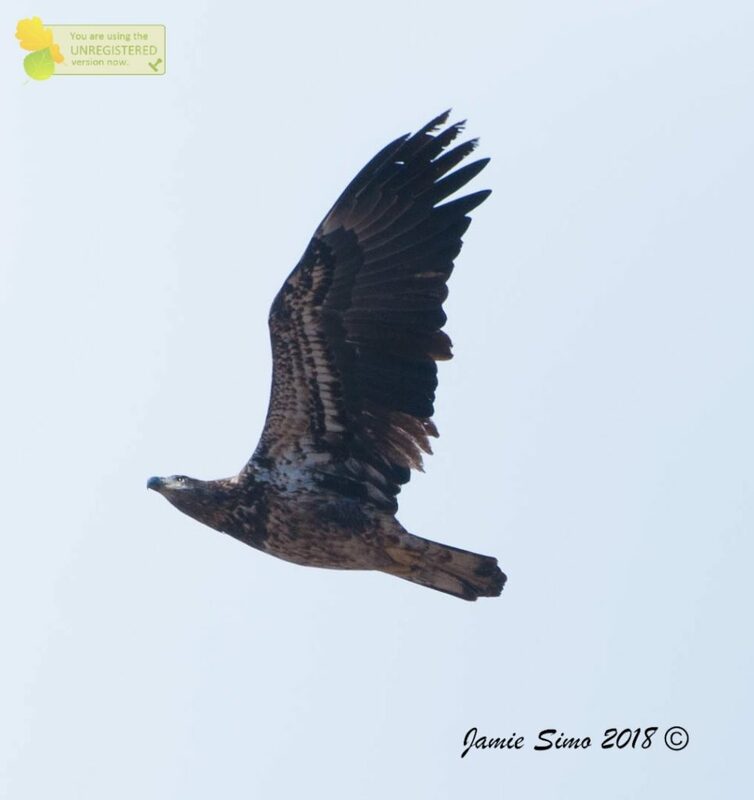 Key attributes to look at are lateral head shape (rounded, not peaked with slight tuft), frontal head shape (has jowls), bill shape (large black nail on tip), and the extensiveness of the white wing-stripe on birds in flight (extends from the body to the end of the wing). A more subtle attribute to look for has to do with the iridescent head color, Greaters are green, and Lessers are purple, BUT be mighty careful here. 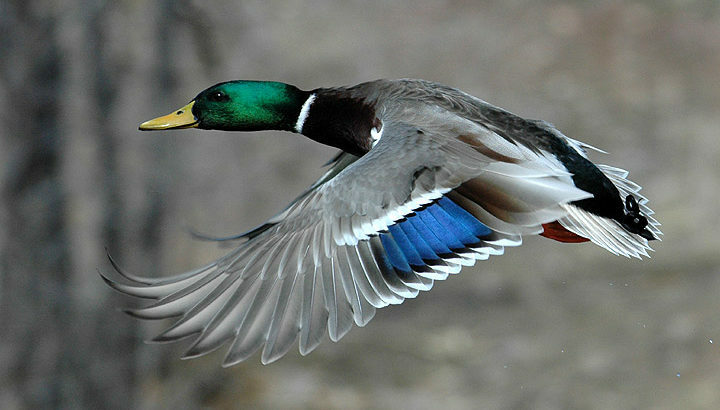 We all know how in certain light Mallards have green heads and other times they have purple heads. 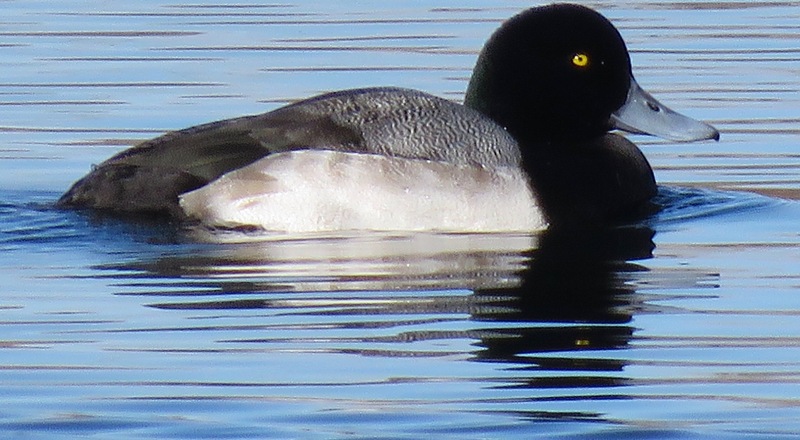 Head color in scaup is not a reliable characteristic, but, coupled with seeing other pertinent details, it can help lead you to a proper identification. 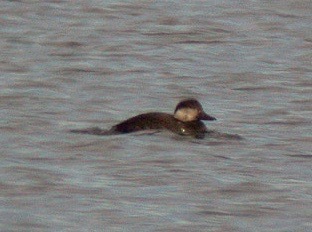 Perhaps the bird of the day was a Black Scoter. We are fortunate to get to see all three North American scoters in Colorado – Black, Surf, and White-winged, but these are primarily seaducks and their appearance here in the middle of the continent is relatively rare, and generally it is during fall migration that we could get lucky enough to see them. Our bird was apparently an adult female, but first-winter juveniles, both male and female, have a very similar plumage. 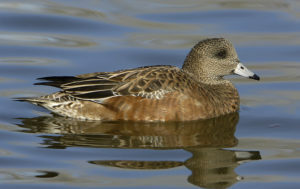 Key features include a dark cap and pale cheeks on an otherwise rather plain brown, stocky duck. One other bird of note for the day was a Northern Shrike. 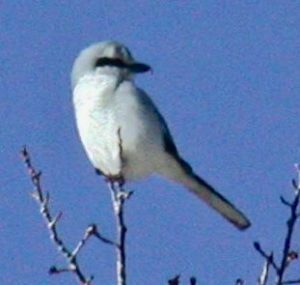 We get Loggerhead Shrikes breeding in Colorado, and then in winter we’re fortunate to get Northern Shrikes. Both are very striking birds with their dramatic mix of white, gray and black patterning. With Northern Shrikes key features include a longer, more strongly hooked bill, and the black mask is narrower than on a Loggerhead. All in all, a very enjoyable morning! Saturday, what with cold, drizzling rain and gusting winds, was not necessarily a good day for fair-weather birders, and about half the folks registered for our bird walk were no-shows. Those who did show up, all women by the way, were totally psyched to be there, well prepared for the weather, and had a great time. With Hudson Gardens being adjacent to the “Flat” Platte we always seem to get great views of the ducks on the river, and Saturday was no exception. 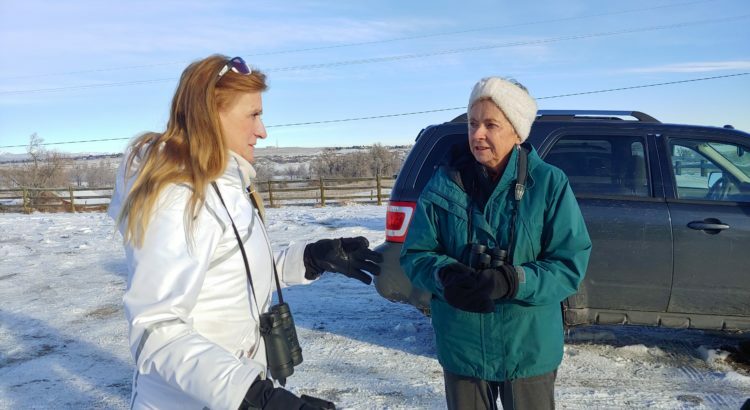 Everyone learned a lot about identifying the seven duck species that we saw, with some folks even starting to discern extremely fine points of identification all on their own – great observers! 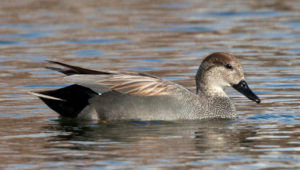 I’m confident that in the future everyone will be far more self-assured in identifying both male and female Gadwalls – not one of the more colorful ducks, and the female is definitely a tricky ID even for moderately good birders. 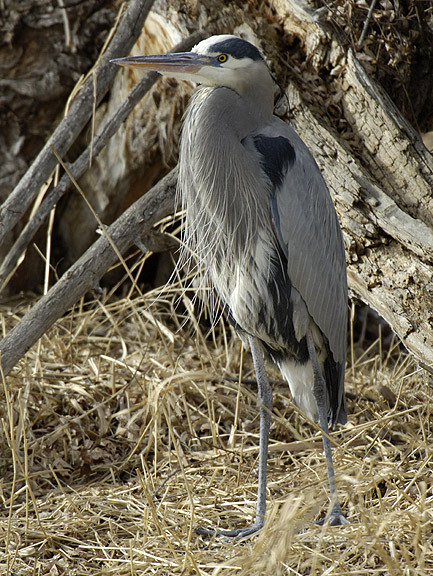 One of our early highlights was getting good close views of a Great Blue Heron standing in a little streamside estuary and being aggressively challenged by a muskrat. The muskrat kept circling around the Great Blue and to all appearances being quite brave in its attempt to drive the heron out of its home territory (we’ve seen baby muskrats in this same area on other outings). Eventually the heron strolled off and the muskrat seemed mollified. Great Blues are voracious carnivores. They eat everything: fish, worms, aquatic insects, mollusks, crustaceans, amphibians, reptiles, birds (eggs, nestlings, ducklings, rails, bitterns, etc. ), and mammals (mice, voles, chipmunks, squirrels, rabbits, muskrats, gophers, etc.). Not surprisingly they have been known to choke to death on an overly large prey item. Here’s a link to a video of a large fish being successfully swallowed whole – however, it’s not for the faint of heart – https://www.youtube.com/watch?v=1v5w0UK2SvE. You can even find videos of Great Blues eating muskrats if you’re so inclined. On a prior Hudson Gardens walk last breeding season we got to watch a similar standoff in which a Red-winged Blackbird was attempting to drive off a Great Blue from within a stand of cattails. The heron would crouch down and then make dramatic leaps into the air unsuccessfully attempting to snag the Red-wing. We left not knowing the outcome of that encounter. One of the other highlights of the morning was the good diversity of birds seen at the bird feeders in the Bird Garden. Besides the usual House Finches and Black-capped Chickadees, we got to see a White-breasted Nuthatch, a Song Sparrow, and several American Goldfinches. These are all species that can be seen year-round in the Denver area. Then, we also got to see some recently arrived migrants that will spend the winter here – a couple of American Tree Sparrows, and a nice variety of Dark-eyed Junco subspecies. 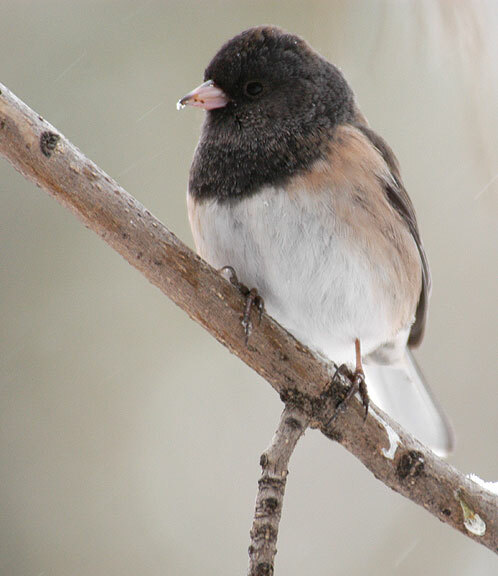 We have one subspecies of Junco that is in Colorado throughout the year – the Gray-headed. However, there are an additional five subspecies that, having bred up in the boreal forest of Canada, the Pacific Northwest, and the Northern Rockies, come here to spend the winter. 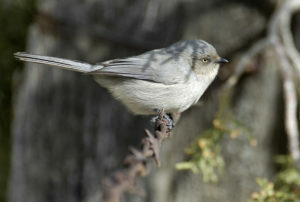 We were fortunate to see four subspecies at the feeders. A nice mix! Hope to see you soon on another great Hudson Gardens outing! This morning’s walk was a bit abbreviated as cold rain mixed with a bit of sleet sent us scurrying back to the cars posthaste. Prior to that though we were able to enjoy a productive couple of hours working on our duck identifications. We did not work on geese or grebe IDs because we saw none. However, the ten duck species we saw now were spectacular. Most of the males were in glorious breeding plumage, though a couple of Mallards and several Northern Shovelers were still a bit betwixt and between. 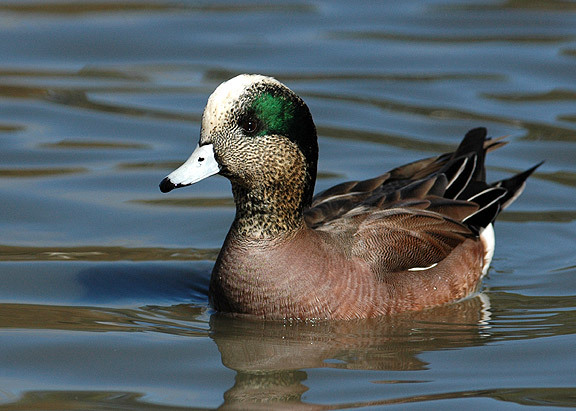 Duck highlights included great looks at American Wigeons, Green-winged Teal, and Hooded Mergansers. 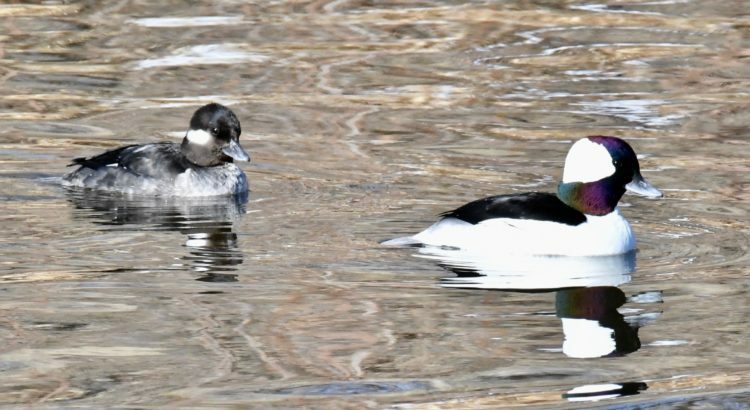 And, as we continue to look for new arrivals of those ducks that bred up in northern Canada and will now spend the winter with us, it was gratifying to find a pair of Common Goldeneyes. 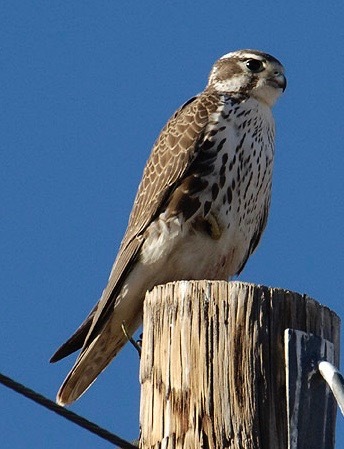 The main highlight of the day was a Prairie Falcon, which we saw almost immediately as we first got out of our cars. It was perched initially on top of a light post along Kipling, and then flew rapidly over to the top of another light post along Quincy. This is part of a common foraging strategy for wintering Prairie Falcons. 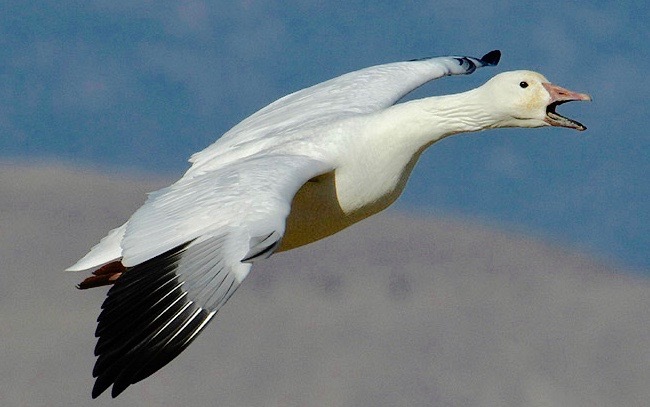 From the top of a pole, or cliff, they can effortlessly survey their surroundings, and then once they have sighted a potential prey item the can swoop down, flying low, fast, and quite powerfully towards their quarry. This behavior, alone, can almost be diagnostic in identifying a Prairie Falcon. Fortunately, we were also able to ascertain that it was a large falcon with obvious pointed wings. Then, once it was on its second perch, we could make out the characteristic malar stripe below its eye. (You might want to check out the introductory pages of your field guide to familiarize yourself with where the malar region is in a bird’s topography.) We could also see the dark ear-patch, and the distinctive white patch between the dark malar stripe and dark ear patch. 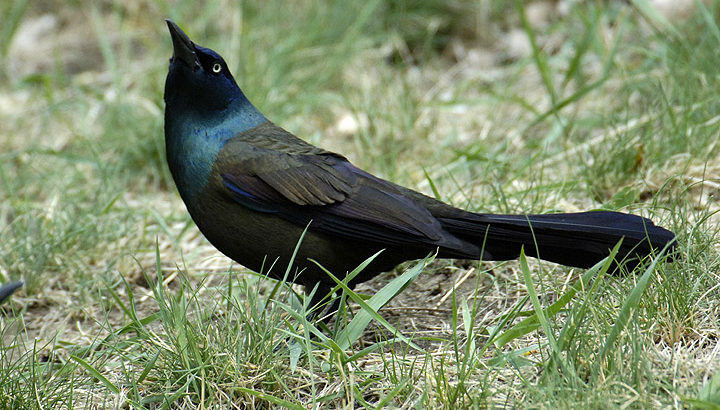 Again, though, it was the behavior of the bird that offered the best initial clues as to what it was. So, once again, Harriman delivered. It’s an excellent place for beginning birders as the lake is small enough that it’s possible to make out many of the ducks just with binoculars.